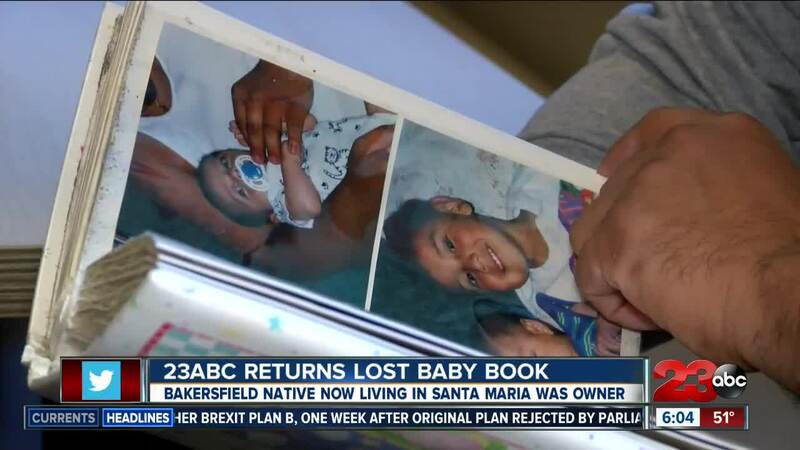 SANTA MARIA, Calif. — There has been a mysterious baby book inside the 23ABC studio. A couple years ago (we're not sure exactly when), someone brought the book to the station, saying they found it and hoping we could locate the owner. At the time, we were unsuccessful. Recently, 23ABC posted pictures of the book to social media again, hoping to find the owner. This time was successful. The book belongs to Jorge Sanchez. Sanchez said he is from Santa Maria and left the city to escape drugs, moving to Bakersfield. He said in Bakersfield, his addiction got worse, he became homeless and attempted to take his life. He ended up losing everything when he was on the streets, including the baby book containing the only pictures of his oldest son as a baby. About a year ago, he moved back to Santa Maria to turn his life around. His kids are back in his life, he's returning to school and he now has a job he's proud of at McDonald's. 23ABC hand delivered the baby book to him in Santa Maria, which brought him to tears. "It reminds me even though everything was lost back then, happiness can be found again," said Sanchez.